Youth Trad Song is an exciting idea born out of a love for traditional singing. A group of dedicated volunteers organizes the weekend. Learn more about becoming a committee member. Some of Chris' earliest memories involve sitting in someone's lap around a fire, ear pressed up against a chest resonating with a low note. She kept that soft spot for basses as her folk experience widened from sea shanties, music hall ditties, and work songs to include shape note hymns, and post-morris dance pub singing. She has a penchant for wordy songs, and is the only member of her law school class to study for the bar exam using hypothetical fact patterns from Child Ballads. In her day job, Chris provides civil legal services for New York State prisoners. Morgan has been steeped in the folk community since he was born. At just 4 months old, he made his debut performance “singing” at the midwinter celebration Welcome Yule. Since then, he has taken up piano, and now enjoys singing and arranging 3- and 4-part harmony to songs written hundreds of years ago. Morgan currently attends Greenfield Community College, where he’s studying to become a music teacher. Rhys is a western Mass native who has traveled to a variety of places, often in search of good music and good dancing. Rhys has been singing since childhood, and has most recently spent a lot of time singing while doing grounds work at Pinewoods Camp. Particular folk music interests include (but are not limited to) Corsican paghjellas, Sacred Harp, sea shantys, miner’s songs, song-swap circles, and regional differences in vocal resonance. Rhys thinks salted caramel ice cream may be the most delicious thing in the world. Ian’s parents used to make fun of him for belting out sea chanteys while mowing the lawn as a kid. Their fault; they started him on the music. After screwing up the courage to sing in a few folk club floor spots while studying in London, he really discovered trad session singing through the Morris world and Exceedingly Good Song Night in New York City. Ian loves close harmony singing, when you’re so in tune with the other singer that you can feel your voices physically pushing together. He also sings shape-note and classically, and plays the fiddle and viola. When not making noise, Ian is a writer and editor. Anna has been singing all her life, but it was in children’s choir that she got addicted to harmony and the social aspects of singing. In college she discovered the folk community and was happily stunned to find that she was not the only person on Earth who listened to folk music. When not singing or trying to learn more than one chord on the banjo, she writes about science. She has tragically managed to lose the red jacket in this photo somewhere in her own house. Nicole Singer is a musician, teacher, and artist living in the Pioneer Valley of Massachusetts. Nicole sings sea songs and chanteys, gospel, work songs, ballads, blues, and lots of other things. With Julia Friend, she co-authored the Folk Sing Starter Kit for the Country Dance and Song Society. Nicole has performed or taught at many festivals, camps, and colleges, and at local participatory sings from Baltimore to Boston and many places in between. She can sometimes be found singing aboard tall ships too. When she’s not singing, Nicole teaches visual art at an elementary school in Amherst, MA. “Singer” is her real last name. Jess learned to sing harmonies sometime in toddler-hood through a process of osmosis, a learning mode that fails to serve nowadays, alas. Jess grew up in a rich family tradition of unaccompanied harmony singing. In Minnesota, Jess is a regular song leader at local Shanty and Pub sings, and has performed at the MN Irish Fair and at Traditional Singers Club concerts. Jess is a member of The Free Range Orphans, singing backup on Riki Schneyer’s record, Children of Zion. She also hopes to record soon with her family group, Whinny Muir. Jess loves all genres of old English language folk songs, from ballads to gospel, from the British Isles to the American South. When not singing in pubs, Jess facilitates music and art projects at a day center that provides services for adults with disabilities. Becky has loved singing since she can remember, though she didn’t discover the traditional song community until college. 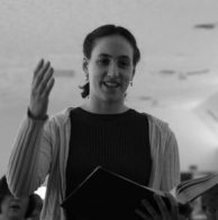 An avid Sacred Harp singer and organizer, Becky serves as a Board member of the Western Massachusetts Sacred Harp Community and has chaired the Keystone and Western Massachusetts Sacred Harp Conventions. Becky’s non-singing pursuits include morris dancing, working in health communication, and feeling nostalgic for Philadelphia things (like tofu hoagies, numbered streets, and cars that don’t stop for pedestrians). She particularly enjoys minor keys, small-group singing, and room-shaking harmonies. Youth Trad Song never would have come to be without its founding committee, including 4 members who have moved on to other projects. Please join us in thanking Jonathan Leiss, Natty Smith, Mel Novner, and Julia Friend for all that they did for this event! Jonathan Leiss’s earliest musical memories are of listening to LPs of sea shanties and by Jean Ritchie. At the tender age of ten he embarrassed himself by lip-synching to Woody Guthrie at a Sunday School ice-cream social and lip-synching party. Since then he’s taken up claw-hammer banjo, learned to can pickles and jam, and become a professional fire fighter. Jonathan lives with his wife in Hillsborough, NC, where they have realized their dream of owning a farm. He was tickled pink to be a part of Youth Traditional Song Weekend. As a child, Natty was constantly asked by his parents to stop singing to himself on his high chair during dinner. He studied violin while growing up, and sang in Christmas Revels productions during the year and in singing classes with folks like Peter and Mary Alice Amidon, and John Mayberry and Jamie Beaton, in the summers. He can usually be heard singing after Morris dancing somewhere in North America or England, or while sailing off the coast of Maine. Natty teaches high school English in Salem, Massachusetts, plays fiddle, Morris dances with the Pinewoods Morris Men, Maple Morris, and Thames Valley International, and serves on the Pinewoods Camp, Inc. and Country Dance & Song Society Boards of Directors. Mel has been singing off-key with folkies in bars since zir childhood in Minnesota, and has expanded to singing for more than warmth. Zie’s discovered a love for Sacred Harp and Sea Music in recent years, and is always up for a rousing chorus. When not singing, morris dancing, contra dancing, blues dancing, playing the concertina badly or searching for Bigfoot, zie enjoys petting furred seals. When she was a kid in NY most of Julia’s family outings were to folk concerts, song parties, and singing weekends. She branched out into Contra and Morris dancing but still loves singing and listening to ballads, chorus songs, etc more than anything and so she was very pleased to co-author the CDSS Folk Song Starter Kit with Nicole Singer. Julia repairs woodwind instruments and sells her Stringcycle guitar string crafts at festivals and at stringcycle.etsy.com. What do Organizing Committee Members do? We have a great time dreaming up ways to make YTS better every year and figuring out how to put those dreams into action. We all love singing of course, and we also love working together and bringing our various skills to this collaborative adventure. We’re usually joined by some “super volunteers” with special roles, too. If you're potentially interested in joining the committee, you can let us know at info@youthtradsong.org. We will bring people on by consensus of the existing committee as openings come up. Has attended at least one YTS weekend. In the “youth” category (under age 50). Familiar with and excited about enacting and promoting the mission of YTS. Committed to shaping a fun, positive, inclusive, progressive community of singers. Able to attend Google Hangout meetings regularly. Meetings are scheduled at least once a month, and can be held more frequently during busy periods. Subcommittees also schedule separate meetings. Able to work thoughtfully and effectively in small and large groups, as well as on independent tasks. Able to be a welcoming and friendly representative of our committee, event, and community. Able to adhere to deadlines and complete tasks in a timely manner. Welcomes difference of opinion, navigates delicate interpersonal situations, and participates in crafting compromises. Has integrity, a sense of humor and the ability to self-reflect. Understands and is invested in their local song communities. Comfort with (or willingness to learn) use of Google Drive and spreadsheets. Bonus skills such as: financial bookkeeping, registration data manipulation, website design and maintenance. Join our MAILING LIST for infrequent but crucial updates!